Cobalt Carnival Spatter Glass Cruet, Bargain Shack offers Boyd Glass, Mosser Glass, L.G. Wright, and Contemporary Collectible Glass including Vaseline Glass - J.B. Scottie Dogs, Pooche, Animal Covered Nests, Toothpick Holders, Salts, Glass Animal Figurines, Clowns, Dolls, Slippers, Vehicles, and More! Just look at this beautiful Cruet in Cobalt Carnival Spatter Glass from Gibson Glass! 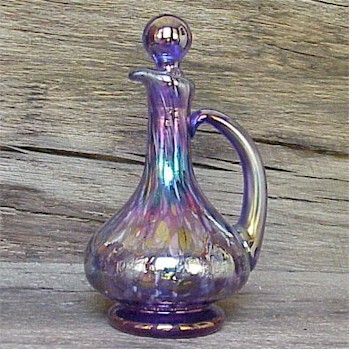 What a gorgeous color for a classically designed cruet. It stands approximately 7 inches tall and the bottom is stamped Gibson 2000. This piece is from the last of the inventory before the business closed. Though hard to photograph each cruet is splashed with different colors in the finish. You are going to treasure this cruet!